Strengthen your workforce with a variety of training grants and programs for businesses. To learn about these incentive opportunities, please contact a member of our Business Development team at (352) 873-7955 or 800-746-9950. Or click on the button below for a contact form. CareerSource CLM’s paid internship/work experience trainee programs offer businesses the opportunity to try out potential employees at our cost. Our paid internship/work experience program identifies individuals who are coming out of training, or individuals who may lack experience in certain areas. The program pays individuals to work 20 to 40 hours a week for up to 12 weeks or 360 hours at your place of business. Wages, worker’s compensation and other related payroll costs are paid by CareerSource CLM so that businesses are not liable for payroll, taxes, worker’s compensation or any other related costs. Internships are for area postsecondary students or recent graduates with technical training, but little or no experience. Work Experience focuses on career seekers who have work experience but whose job-speciﬁc skills need updating. Selecting and training an intern/work experience trainee allows businesses to train, observe and develop the trainee. By the end of the program, businesses can gain a valuable new asset for their organization by offering interns/trainees full-time employment. 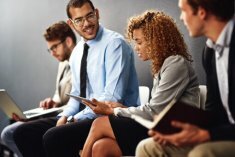 Hiring events are customized to ﬁll individual businesses’ immediate recruiting needs and can be held at one of our Career Centers, the business workplace or an alternate site. Job fairs are a fast, efficient and effective way multiple businesses can meet with hundreds of career seekers in once place on one day. Career fairs are smaller, more casual hiring events dedicated to an industry or specific sector. Logistics, promotion and staff-support provided at no charge. With more than 1,200 validated occupation and job-specific pre-employment tools available, Prove It! is one of the most versatile assessments available. Find out if your applicant skills are up-to-date by having them complete assessments that demonstrate they have the skills needed for your position. Test scores and results can be provided to you as soon as the applicant has completed their assessment(s). These results can help you determine if the applicant has the skills needed for your position, and/or if your current employees need additional training. We also offer customization of assessments for your needs. Microsoft Office tutorials and Practice Typing tests are available, as well as hundreds of assessment for clerical, software, technical, call center, industrial, financial, legal, medical and more. All of these assessments are part of our value added services to businesses at no charge. Contact a member of our Business Development team for more information on how to take advantage of these assessments. CareerSource CLM has been a leader in acquiring state and federal grants. Over the past five years, we have acquired more than $6 million in grant funding to serve area workforce needs. Our team identifies gaps in the workforce talent pipeline and develops strategic grants to fill those current and projected needs. For information about additional financial incentives, please visit CareerSource Florida. To post jobs or view Labor Market Information, check out Employ Florida.